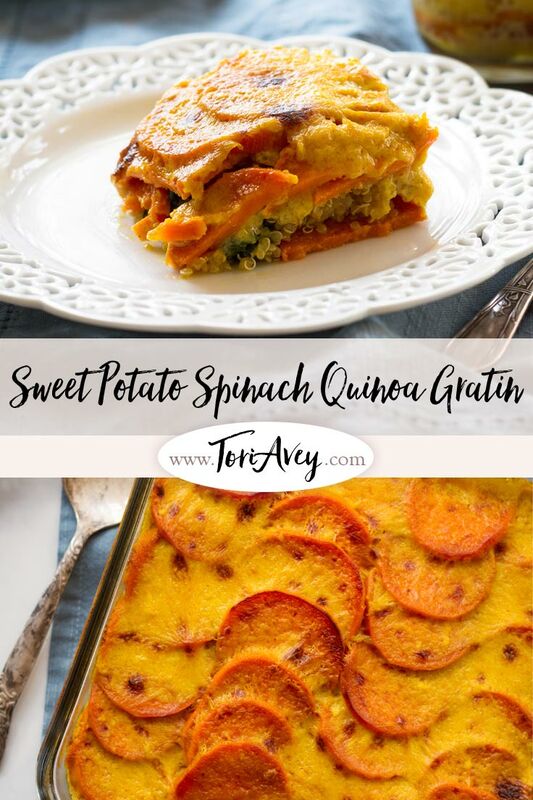 Sweet Potato Spinach Quinoa Casserole – Vegan gluten free entree for Passover or anytime, topped with a rich coconut-saffron “gratin” sauce. Developing a vegan entree for Passover is tough business. My vegan guests deserve an entree at the Seder table, but finding one that is flavorful enough for a holiday is a real challenge. Over the past couple of Passovers I’ve given myself the task of coming up with a vegan entree option that isn’t just an afterthought, but something truly comforting and filling. When you remove meat and dairy, then apply Passover restrictions to your list of options – there’s not a whole lot left to work with! Never one to shy away from a challenge, I put on my thinking cap and came up with something pretty amazing. 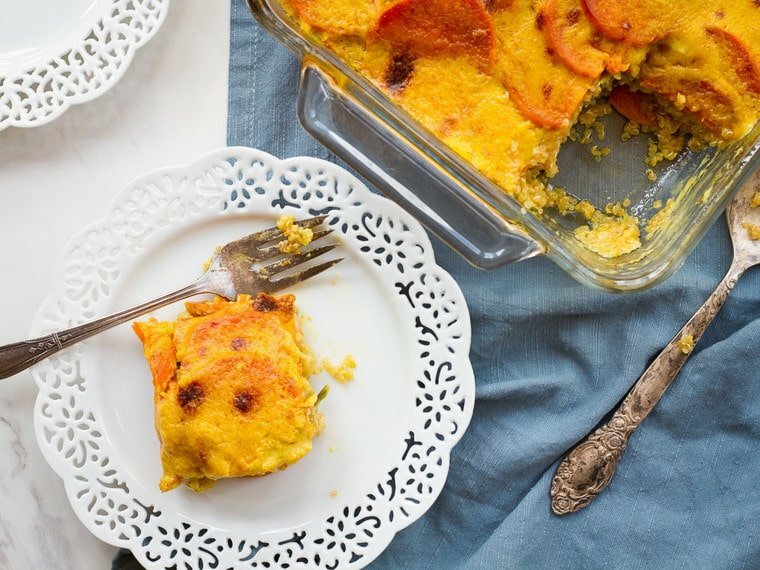 Vegan or not, this casserole is really, really delicious! 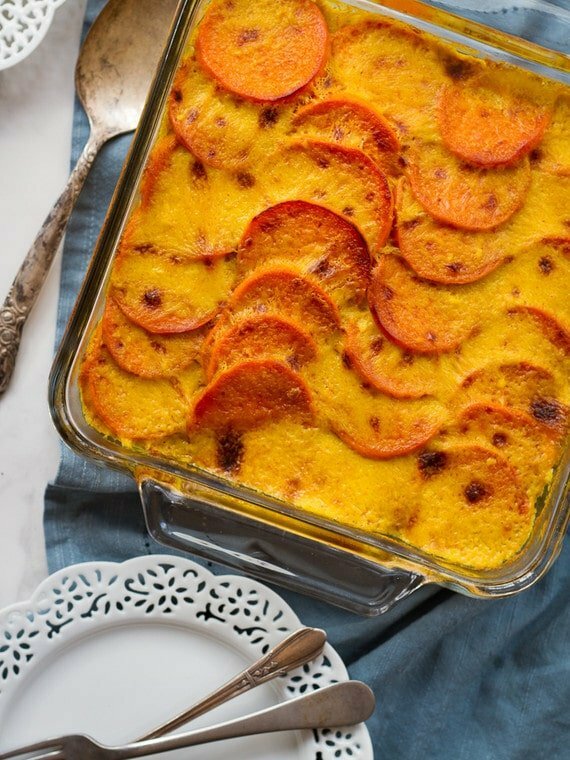 This recipe was inspired by my Dairy Free Saffron Scalloped Potatoes, which are made with a delectable coconut milk and saffron-based sauce. It has the creaminess of a dairy dish with the exotic flavor of saffron, which elevates it to something truly special. 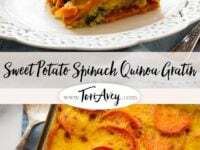 To make the dish more filling, I sandwiched a layer of quinoa and spinach between the roasted sweet potato slices, topped it with sauce, then baked and broiled it gratin-style. The quinoa provides Passover-friendly protein and makes the dish more hearty overall. This recipe is something I’ve been developing in my head over a the course a few weeks, knowing that all of the ingredients are tasty and should work well together. Even so, I wasn’t sure it would work until I tested it– then retested it– then tested it again, because I couldn’t stop eating it! 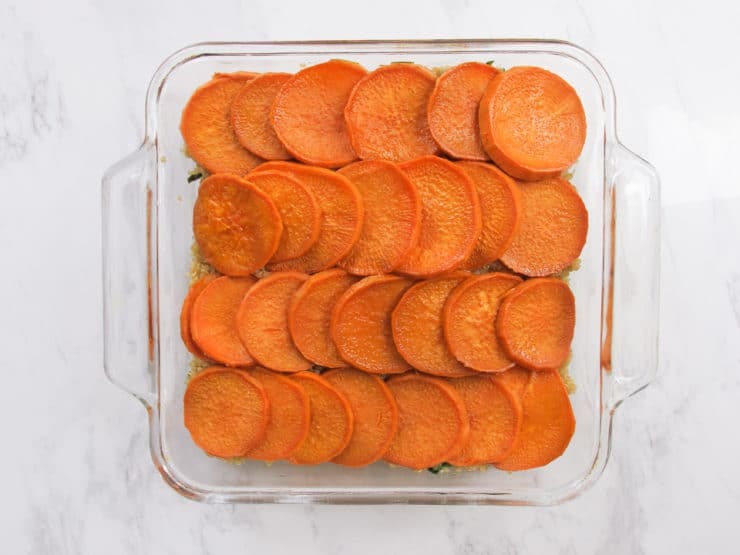 This Sweet Potato Spinach Quinoa Gratin is really unique, and it’s also a very pretty dish. It’s definitely worth a try as a vegan option for the Seder table, or for Meatless Monday, or just because. Enjoy! Note: Although the photos in this recipe use a glass dish, please use a metal baking pan here, as it's safer for broiling-- or, if you use a glass dish, skip the broil and simply bake until it's browned. Preheat oven to 400 degrees. Spread the sweet potato slices across two lightly greased baking sheets. Toss each sheet of slices with 2 tbsp extra virgin olive oil to lightly coat the slices. 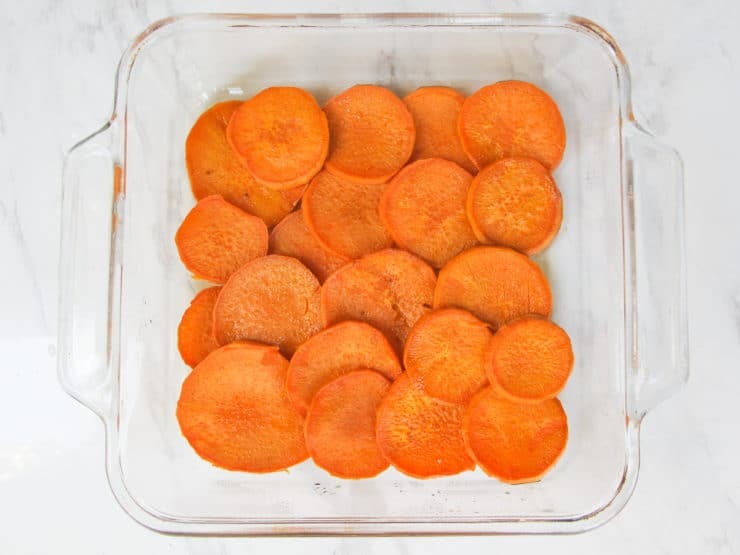 Roast the sweet potatoes for 20 minutes in the oven, stirring the potatoes and turning each baking sheet around once during cooking, until slices are tender and starting to caramelize. While sweet potatoes are roasting, rinse the quinoa out well in a mesh colander until water runs clear. Combine rinsed quinoa and low sodium vegetable broth in a pot and bring to a boil. Reduce to a simmer, cover the pot, and cook for about 15 minutes, stirring occasionally, until broth is absorbed and quinoa is tender/fluffy. 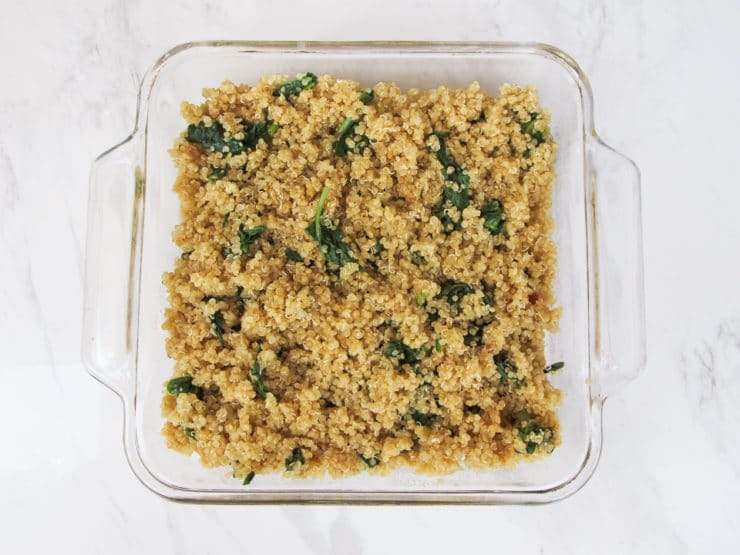 When the quinoa is finished cooking, quickly open the pot and add the roughly chopped spinach on top of the cooked quinoa. Recover the pot and let it rest for 5 minutes while the spinach wilts on top of the quinoa. 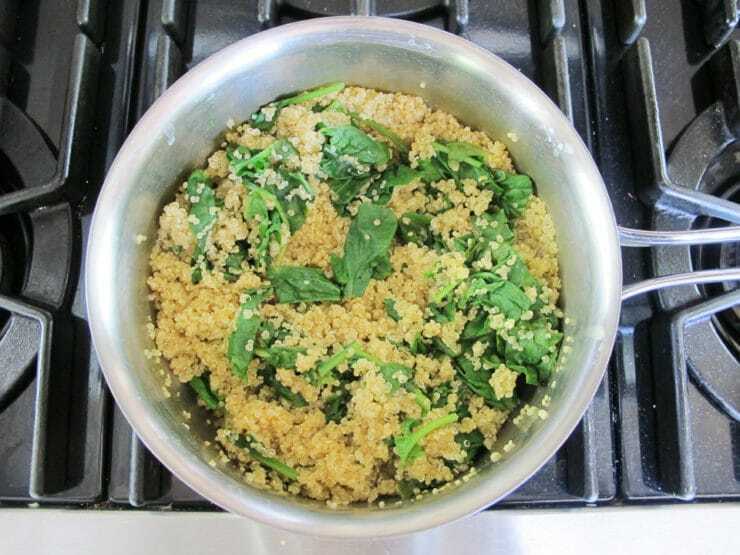 Stir the spinach into the quinoa. Reserve. 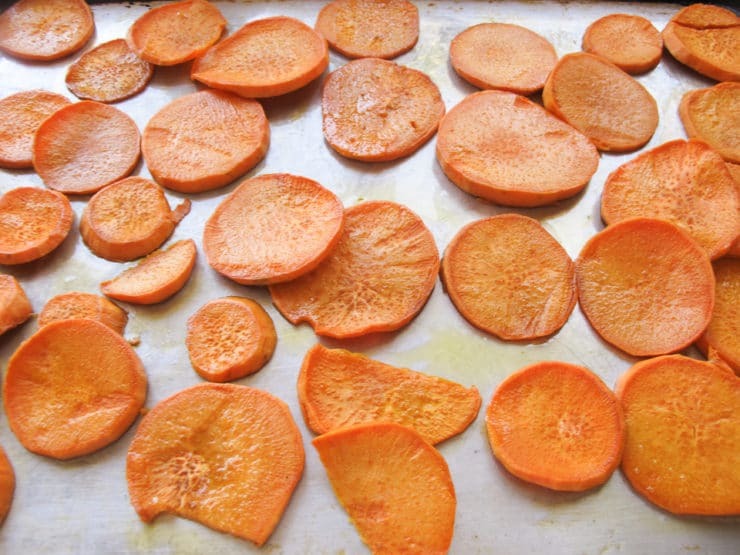 After sweet potatoes are removed from the oven, reduce heat to 350 degrees F. Reserve the sweet potato slices. 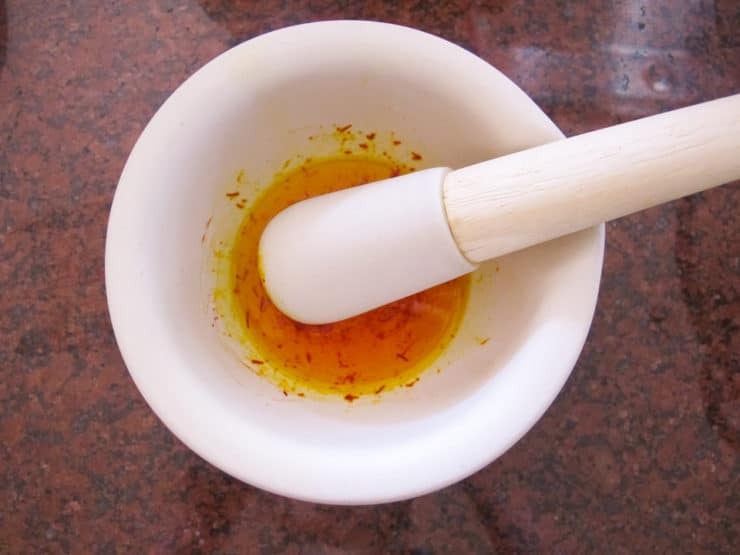 Grind the saffron threads in a mortar and pestle to a powder. Add 2 tbsp of hot water to the ground saffron and let it soak for a few minutes. Lightly grease an 8x8 inch baking dish. 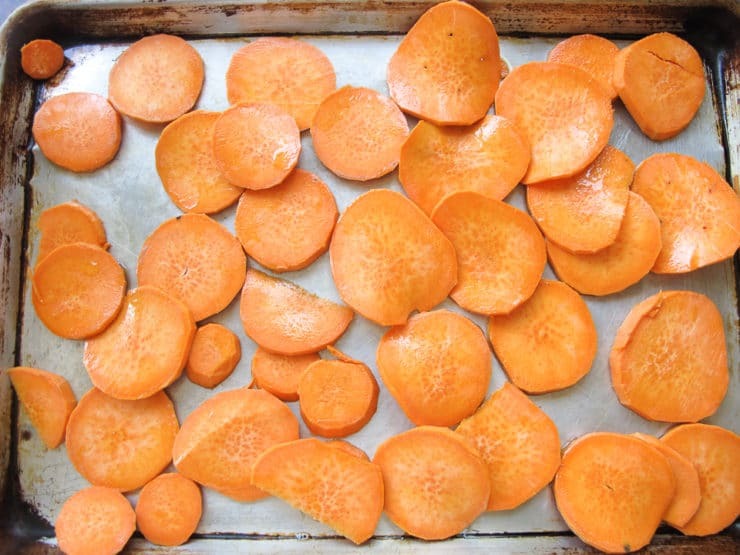 Place half of the sweet potato slices in a thin layer on the bottom of the dish, with each slice overlapping the next. Spread the cooked quinoa/spinach mixture over the first sweet potato layer. Make a top layer with the remaining sweet potato slices. In a small saucepan, melt 2 tbsp non-hydrogenated margarine over medium heat. 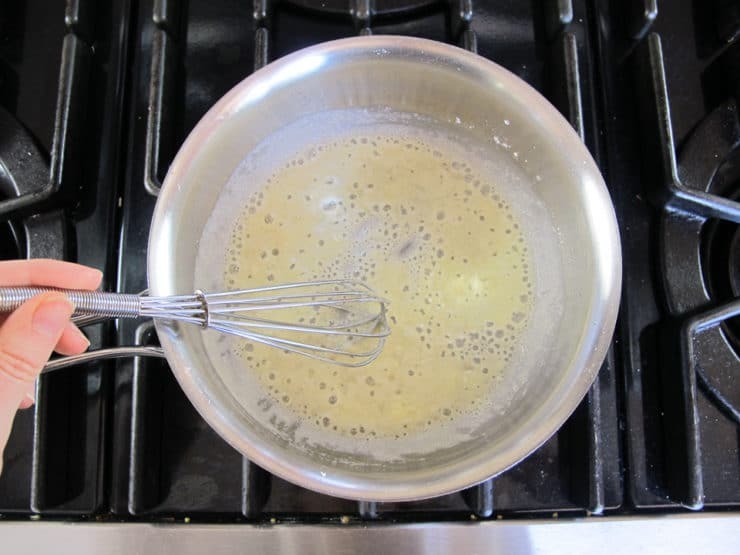 Whisk in 1 tbsp potato starch to form a thick paste. Slowly whisk in the coconut milk. Whisk in the salt, garlic, cayenne pepper, and the reserved saffron water. 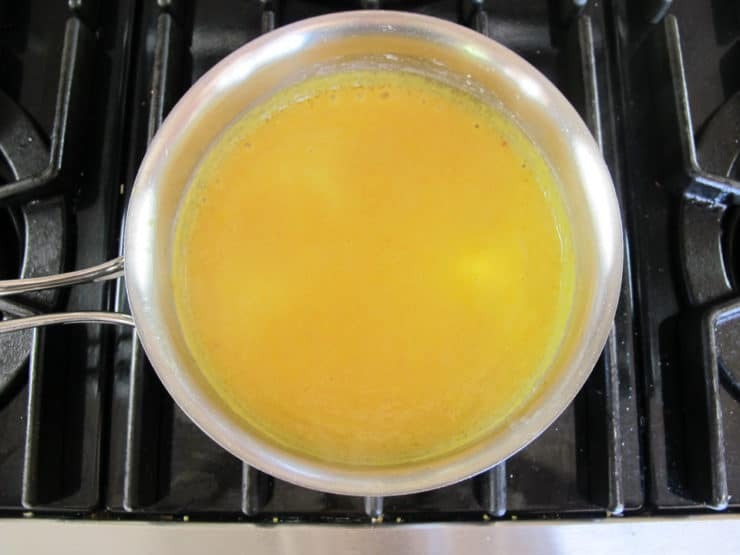 Heat the sauce over medium, whisking frequently, until it boils and thickens into a golden yellow sauce. Reduce heat to low and keep warm. Pour the sauce over the layer of sweet potatoes, using a ladle or large spoon to make sure the potatoes are evenly covered with sauce. Place dish in the oven and bake covered for 20 minutes until heated through. Remove the foil and turn on your broiler. Place your baking dish 6 inches below the broiler. Broil the casserole for a few minutes until the top is nicely, evenly browned. Note - if you use a glass baking dish, skip the broil and simply bake until it's lightly browned on top. Serve warm. This is a great recipe! Especially for a pot luck type of event as it can be served hot or at room temp? My only recommendation is to have the sauce settle a bit into the dish so people can see the sweet potatoes. Uniquely delicious! With every bite, I fell more in love with this dish, as did everyone else at the table. I need to seek out more saffron rich recipes. Thanks Tori! Fantastic Jill! So happy to hear that. This sounds delicious and perfect for the dish I am looking to make for a sick friend allergic to so many things. I have the saffron but no mortar or pestle. Can I grind in a processor or just use the strands as they are? What can you suggest as alternative? Thank you. You can skip grinding them, but do not skip the soaking step. My family is not a big fan of saffron or tumeric. Can I omit the spice? Or is there something more mild or common that I could substitute? The sweet potato, spinach and quinoa combo sounds great! Hi Sue! Saffron is integral to the overall flavor, it imparts a cheesiness to the sauce. 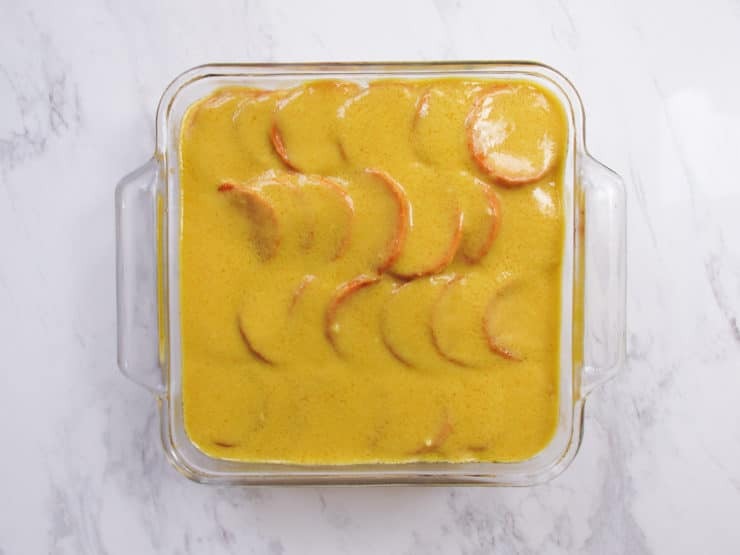 You could try adding a bit of nutmeg to make it more like a béchamel sauce, but it might lack the buttery flavor of the original, which relies on saffron to enhance the savory flavor. As I haven’t tried it myself I can’t say for certain. I just deiscovered your website – and this recipe – while searching for vegetarian, gluten free entrees that could be used for Passover. It exceeded all expectations and was enjoyed by everyone. I made it a week ahead, baked it completely, and then froze. It reheated well and was delicious! Definitely a keeper – thank you! Fantastic Anne! Thank you for letting me know you and your guests enjoyed it, and that it froze well for you. Your website shows a pyrex dish under the broiler. I thought you were not supposed to broil in pyrex. Hi Denise, thank you for the heads up. I have never had an issue broiling with Pyrex, as I generally only broil to brown at the very end of cooking for less than 5 minutes– I never leave it under the broiler very long. But you are right, it is probably safer to use a metal baking pan instead– or skip the broiling step. I’ll note it in the recipe. Hi, if we need to use ground saffron how much would we use and would the process change at all? Hi Cara, I don’t recommend ground saffron here– good quality saffron comes in threads, and the ground kind is often cut with less expensive spices which reduce the potency and flavor. If it’s your only option you can try 1/8 tsp, and stir it directly into the sauce (no need to add it to water first). Taste the sauce and adjust for flavor, adding more seasoning to taste if desired. Good luck! I would like to try this recipe but can’t get Kosher for Passover margarine. What can I use instead? If you can find buttery flavored coconut oil, try that! Otherwise regular coconut oil will work, but it won’t turn out quite as creamy flavored. Important if you are subbing these ingredients to taste the sauce after it thickens, and adjust the seasoning to taste. My son recently went vegetarian and I am looking to make this for upcoming passover. I do a lot of my cooking in advance so that I am not crunched before the 1st Seder. If one were to make this a day ahead of time and put it in the fridge would you leave the sauce for the day of and make everything else? You can roast the potatoes ahead and also make the quinoa spinach filling, stored separately. Definitely wait until the day of to make the sauce, assemble and bake. I just made this gratin for a New Years Eve dinner I hosted! It was incredible! Several people asked me what kind of cheese I used! It was so quick and easy except I started snacking on the sweet potato chips and had to make another batch. It is rare I do not alter a recipe but this one is perfect! My vegan friends (and omnivores) all loved it! Hi. This recipe looks wonderful, I am planning on making it for this Shabbat. I don’t have potato starch on hand, I am wondering if I can use brown rice flour instead. If so, would I use the same quantity? If brown rice flour wouldn’t work, what can I use instead of potato starch? Hi Batia, Tori’s assistant Ashley here. I’m not sure how to sub correctly using brown rice flower since we haven’t tried it, but cornstarch is typically the best sub for potato starch. Hope this helps! This recipe looks and sounds delicious. I will definitely make it. One question, why is it so high in sodium? Hello Hanora, thank you for pointing that out. The calories were calculated with traditional broth, not low sodium broth. I updated the ingredient to low sodium and it decreased the daily value of sodium by 12%, which is more accurate. Hope that helps! This is fantastic, and has such a unique, warm, aromatic flavour. The cayenne adds heat but is not spicy – it is essential I think! Next time I would make just a bit extra sauce, and mix the sauce with the quinoa before assembling as I found that it didn’t permeate very well. Just discovered your site! Great blog! Lovely sounding recipes. I’m in the UK. I was wondering what the weight of the spinach should be? I don’t have my cups with me at the moment and would love to make this for tomorrow night. this sounds delicious but I can’t use the coconut milk , what can I substitute for it? Hi Beth, Tori’s assistant Ashley here. Unfortunately, I’m not aware of another dairy free substitute for coconut milk that would give the same results. This looks like an amazing recipe but I have a vegetarian that doesn’t like quinoa, can I use brown rice instead? Hi Naomi, Tori’s assistant Ashley here. We haven’t tried this recipe with brown rice, but I think it would work as a substitute. This is my all time favorite dish and I cook a lot. Wow I could eat this every day. I was so surprised by the complexity of the dish. The garlic, and red pepper add layers of punchy flavor over the sultry coconut milk and saffron base. I increased the spinach, and sprinkled just a little crumbled goat cheese (not for the vegans) and a couple shreds of shredded coconut to make the top a little more interesting. This sounds delicious. However I have not been able to find any kosher for Passover vegetable broth. I have looked everywhere. Any suggestions or substitutions? I love your vegetarian chicken soup and want to make it for my veg guests, but again, can’t find the broth. Hi Stacey– the only suggestion I have would be to make your own vegetable broth in advance. Where would I get saffron? Hi Mya, Tori’s assistant Ashley here! Most major supermarkets and ethnic food markets carry saffron now. Be sure what you’re buying is high quality. It can be pricey, but is definitely worth the cost when it comes to flavor. I made this for Rosh HaShanah. My vegan cousin — and everyone else — loved it! Thanks. I too was a tiny bit skeptical that this would be good. This was soooo good! I halved the recipe and used a lot of Kale instead of spinach which I put on top of the quinoa after 10 min. I also used 1 T of hot veggie broth instead of hot water. Since we had no vegan or Passover restrictions I used cornstarch and butter. Great recipe Tori, thanks! Thank you for reading, Charlotte! I made the recipe for Vegeterian son for 2nd night Seder. He felt dish was a little bland and added some siracchi sauce to spice the dish. If I make again I will add onion to the quinoa and more garlic to add flavor. Coconut sauce is excellent. Made this for our Passover Seder yesterday and it is really flavorful; will make again… thank you! Hi again! I did find the saffron and made this for the Seder. I doubled the ingredients (except for the saffron and water because I forgot to double). It was perfect for a 13×9 casserole! I ended up with some extra sweet potatoes and quinoa that didn’t go in the casserole, but I rather have extra than not enough! Everyone loved it, thank you! PS-canned coconut milk in the Asian food section was perfect. I don’t know if the refrigerated coconut milk would have worked the same. So happy it turned out well. 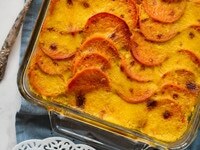 This casserole was a HUGE hit with the vegans and non-vegans at our Passover Seder! I will be making this dish often. By the way, I made it a few days before Passover and froze it. It reheated beautifully, no issue with the coconut milk separating! Fabulous Judi! And thank you for reporting back re: freezing, that will definitely help others. I couldn’t find saffron. Can I use turmeric or something else instead of saffron? Also, can I double the recipe for a 13×9 casserole? Hi Rosemarie, I haven’t tested this with turmeric. It will probably be good in terms of flavor, but it won’t be quite as “special” as the flavor that comes from saffron. Yes you can double it for a larger casserole but you might not need to double the sweet potatoes, I’m thinking 3 pounds would probably be plenty. I haven’t tested it though so can’t say for certain. I’d love to make this today for seder ,,,, can I freeze it? Susan, I have never frozen this recipe so I can’t say if it will work out or not. If I were going to try it, I wouldn’t freeze it with the sauce. Instead I would assemble it, cover and freeze, then defrost and add the sauce before baking. I doubt the coconut sauce will freeze well, but that’s just a guess. There are some in the family with an allergy to coconut. Can you recommend any substitute? Hi Susan– unfortunately the coconut flavor is really central to this dish. You could make it with a cashew cream, perhaps, but I haven’t tested it and I think that the lack of coconut flavor might render the sauce rather bland. I do not have access to kosher for passover coconut milk and I just made this without; I added sauteed onions, peppers and extra garlic to the quinoa. I am sure it does not taste like the original, but it is DELICIOUS! I am going to make it the vegetarian option for our community ( fleisich) seder. Fabulous Nori! Thank you for sharing your version, I’m sure it will be helpful to others. I’m on a high carb, low fat, plant-based diet. Instead of high-fat coconut milk, I use almond or cashew milk + a teaspoon of coconut extract. The result tastes like it was made with coconut milk, but I eliminated most of the fat. I used almond milk, plus coconut extract instead of coconut milk. I also left out the oil and margarine. The dish turned out fantastic! I’ll definitely make it again, but I’ll use less cayenne next time. I think the cayenne overpowered the saffron.